President - Moreno Cardenas Inc.
As a founding member of CEA Engineering Group Inc., Mr. Chavez is responsible for business operations, business development and engineering design. Ruben’s area of expertise includes planning, transportation and stormwater infrastructure throughout the Southwest. 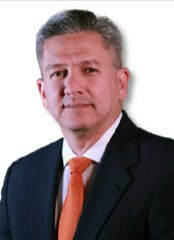 Mr. Chavez has over 24 years of civil engineering experience, 17 as founder of CEA Group. Today CEA Group is one of the largest engineering firm headquartered in El Paso. El Paso Bicycle Advisory Committee, advises the City of El Paso on matters related to bicycle planning and infrastructure. Mexican American Cultural Center Sub-Committee, responsible for advising on the development of the Hispanic Cultural Center’s size, budget, and facility program and amenities. El Paso Historic Landmark Commission (2008-2009), charged with making recommendations on the designation of historic landmarks and districts, and authority to grant certificates of appropriateness in compliance with historic guidelines. Alicia R. Chacon International School Bike-a-thon, program created to inspect and repair children’s bicycles to get them ready for summer break. Engineering Student Leadership Council Endowment, mentoring students and provide funds for engineering students to explore development opportunities outside the classroom.